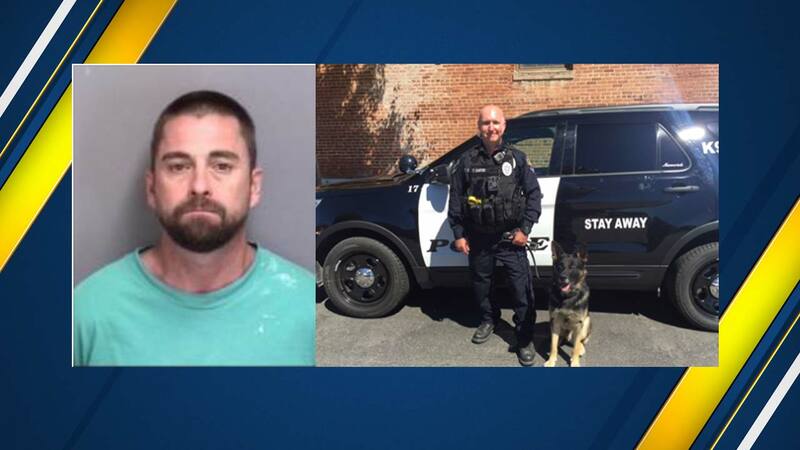 LOS BANOS, Calif. (KFSN) -- Los Banos Police dog "Maverick" made his presence known to a domestic violence suspect and got an immediate response. In a Facebook post, the Los Banos Police says they responded to a residence in the 400 Block of Lime Street on May 19th to investigate a domestic violence report. At the residence Officers contacted an adult female who reported her husband, 45-year-old Justin Glass of Los Banos assaulted her and took her phone while she was attempting to dial 911. Officers discovered Glass had barricaded himself inside of a locked garage and would not come out as instructed. Officer Todd Carter and his K-9 Partner Maverick arrived. Maverick confronted Glass, who immediately surrendered to Officers without incident. Glass was placed under and booked into the Los Banos Police Department Jail, pending $11,500.00 bail, charged with domestic violence and unlawfully removing a communication device from a person attempting to summon assistance. The victim reported minor injuries and Glass was not injured.